Dog owners are urged to be on high alert after news of a new strain of canine influenza or “dog flu” has been spreading across the country. The H3N2 canine influenza virus (H3N2 CIV) is a very contagious influenza virus that infects dogs. Suspected cases have swept through the dog world since the flu was identified years ago in Chicago in 2015. According to the American Kennel Club (AKC), outbreaks have been reported in 30 states including Florida, Georgia, Illinois, Kentucky, Missouri, South Carolina and Texas, infecting thousands of dogs. H3N2 CIV has also infected cats but there is no evidence that it can infect people. The University of Florida, College of Veterinary Medicine recently issued an advisory that they have treated multiple cases of respiratory disease in dogs. There have been fourteen confirmed H3N2 canine influenza cases and multiple other confirmed cases not associated with the university. While H3N2 has been circulating throughout the country, it is the first time it has been confirmed in Florida, which is why there is cause for concern. Common symptoms include sneezing, nasal discharge, and frequent coughing that can last for two weeks or more. 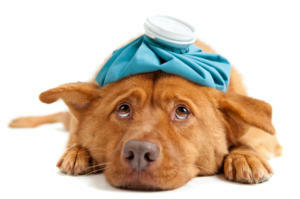 Many dogs have a fever, decreased appetite, and lethargy during the first few days of illness. Some dogs have more serious disease and pneumonia that requires hospital care. H3N2 CIV can cause respiratory infections in cats too. The cats start sneezing and have nasal discharge but usually do not cough. Veterinarians are urging dog owners to take precautions after H3N2 CIV killed two dogs in North Carolina and is suspected of sickening others. The sick dogs are apparently linked to dog shows last month in DeLand, Florida and Perry, Georgia. The dead dogs were from the Raleigh area and North Carolina’s coast. Because the virus spreads so easily, local vets, kennel owners and shelters are on high alert. “This is not a time to panic or to be extremely concerned, but it is a time to be aware and be vigliant,” says Alex Lima, owner of Hollywood Houndz Boutique Spa & Hotel. Lima recommends that healthy dogs be vaccinated – and that is the case for those coming to his boutique & spa. Dogs suspected of having the flu should be isolated from other dogs, experts say, and their vets consulted. Healthy dogs must be kept away from sick ones. Vets, kennels, doggie daycare businesses and shelters should also be on alert for any signs of the illness. Owners who suspect their dogs are sick should keep them from even casual contact with other dogs, such as at dog parks or greenways. Healthy dogs should be safe in these places, but owners should be cautious nonetheless. Symptoms include coughing, lethargy, nasal discharge and fever and can mimic the highly contagious but nonfatal disease known as kennel cough. Canine flu can be tough to diagnose, Dobies said, because tests can reveal it only in a narrow window of time and can’t be confirmed in-house. The virus spreads through the air and can travel up to 20 feet. It lives up to 24 hours on soft surfaces and 48 hours on hard surfaces. Eighty percent of all dogs exposed to it will contract the virus, although not all will show symptoms. Sick dogs show symptoms within 48 hours and can spread the virus for up to 28 days. While most sick dogs will recover with treatment, untreated dogs can develop potentially fatal pneumonia.